Most pertinent to many existing facilities is arc-flash analysis, which NFPA 70E recommends is reviewed and reaffirmed or re-evaluated upon equipment additions at site or at an interval not to exceed five years. As electrical power distribution systems morph over time, ensuring arc-flash risks at electrical equipment are accurately quantified is essential for providing the best possible information to keep site personnel safe from electrical hazards. Arc-flash analysis and arc-flash labeling of electrical equipment for safety of site personnel is the foremost way to satisfy OSHA requirements for providing descriptive markings and warnings for personnel of electrical hazards at a facility. NFPA 70E is commonly utilized for developing electrical site safety programs and followed for arc-flash labeling requirements. 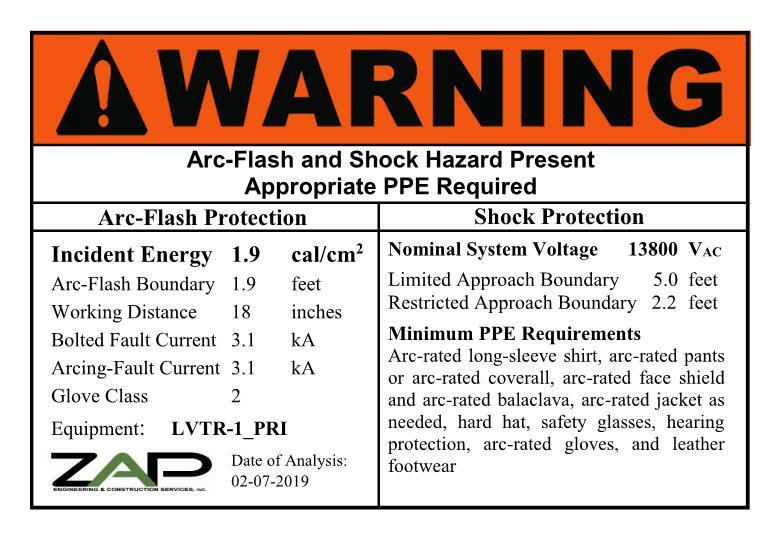 ZAP routinely performs arc-flash analysis for clients to provide electrical equipment arc-flash labeling that descriptively indicate the magnitude of the electrical hazard present at a location to provide site personnel with crucial location information to help ensure their safety. Performed to verify adequacy of both the major equipment short circuit current ratings and the capability of each protective device to interrupt the maximum expected three-phase bolted fault current. 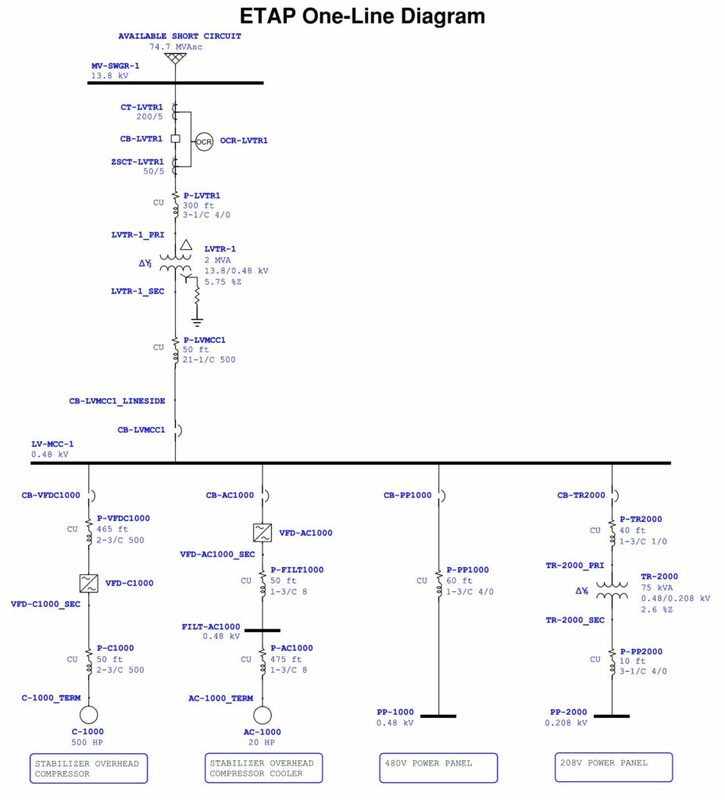 Based on IEEE 141 short circuit analysis methodology. Performed to ensure that electrical power distribution equipment is adequately protected, that protective devices are selectively coordinated where device adjustability allows, and that the arc-flash incident energy will be minimized where reasonably achievable without significantly degrading system coordination. Based on IEEE 242 protective device coordination methodology. Performed to determine the arc-flash incident energy and arc-flash boundary, which describe the potential hazard site personnel may be exposed to when performing work on or around energized equipment. Based on the arc-flash incident energy analysis adequate Personal Protective Equipment (PPE) for performing energized work within the arc-flash boundary is required. Based on NFPA 70E & IEEE 1584 arc-flash analysis methodology. Note: See examples for ZAP standard ETAP arc-flash hazard warning label design. The ZAP team has capability to customize arc-flash hazard warning label design to meet any client requirements. Performed to verify adequacy of system equipment ratings and determine expected voltage drop within the power distribution system is acceptable. Based on IEEE 141 operating load methodology. Performed to verify the voltage dip during across-the-lines motor starting falls within acceptable levels for the site. Large motor inrush currents can generate severe system voltage dips during across-the-lines motor starting, which can affect other system loads if not adequately minimized. Based on IEEE 141 operating load methodology before motor starting. Performed to determine the expected level of harmonic mitigation required. Nonlinear loading, such as many variable frequency drives on a system, can produce significant harmonic content in the system that can lead to increased heating in equipment and cause nuisance tripping of protective devices. Filtering of harmonic content may be required to alleviate strain on the electrical system. Based on IEEE 141 operating load methodology and IEEE 519 recommended harmonic distortion limits. Performed to assess expected or measured operating system power factor to determine an adequate means for improving poor power factor and reducing overall cost of operation. Performed to quantitatively assess the inherent reliability of the electrical power distribution system, and to identify components with the greatest risk of failure. Based on analysis results, recommendations for improving system reliability may be possible to minimize risk of downtime. Based on IEEE 493 reliability data and analysis methodology. The ZAP electrical team can assist in developing electrical site safety procedures to help ensure site personnel are adequately trained, and prepared for working around electrical hazards that may exist at the industrial facility. Adding motors or equipment to an existing installation. Verify capacity of existing equipment to handle additional load. Verify or update equipment arc-flash labeling. I want to be sure that my personnel are wearing the correct Personal Protective Equipment (PPE) and are as safe as possible if working on or around energized electrical equipment. Arc-flash analysis for updated equipment labeling and PPE recommendations. Issue with nuisance tripping of protective devices for unknown reasons. May be one issue, such as high system harmonic content, or several issues that need to be resolved in the system. New facility designs (Greenfield projects). Perform a set of studies to ensure adequacy of the new power distribution system before installation. Conceptual design or feasibility studies. 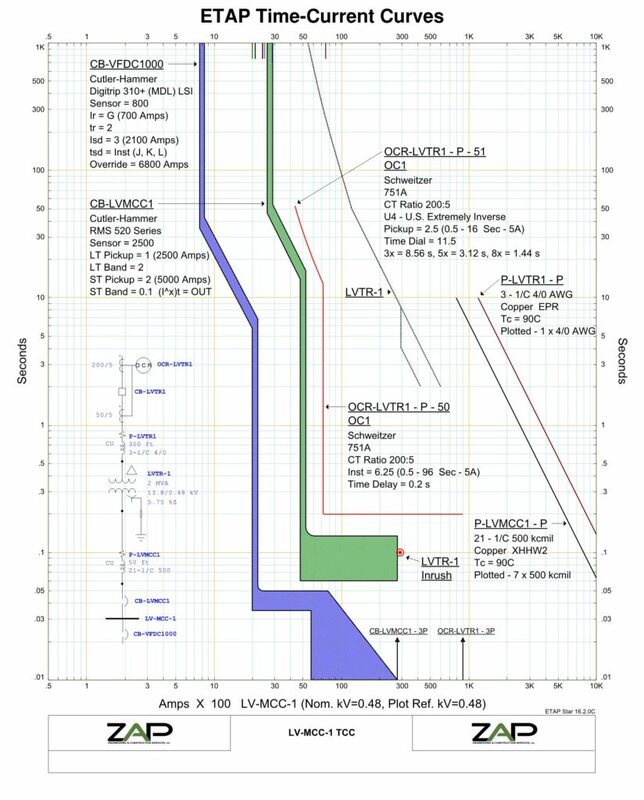 Ensure feasibility of the power distribution design philosophy on a future project. The site was constructed, but formal electrical power system studies were never performed for the facility and I want to know if any potential issues exist in my power distribution system. The utility changed the size of the transformer feeding my power distribution system and I need to verify equipment ratings and arc-flash labels are still adequate. For guidance on what electrical power system studies may be beneficial for your facility, please feel free to contact ZAP Engineering & Construction Services, Inc who are always happy to discuss your power distribution system needs.